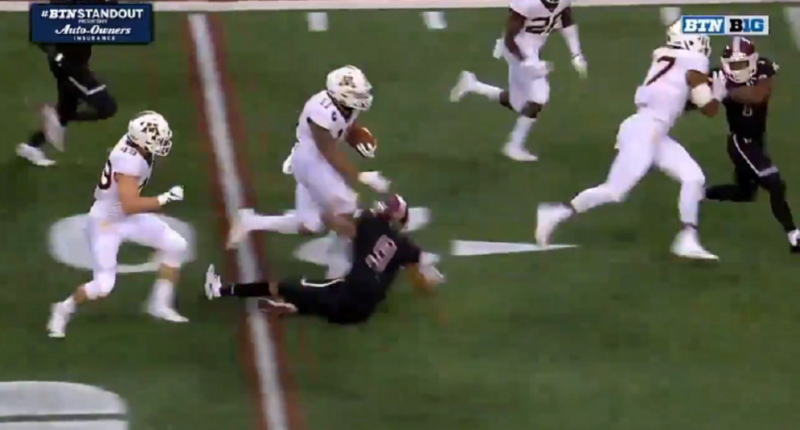 Awful tackling from New Mexico State, but still an amazing return from Winfield. Minnesota came away with a 48-10 blowout victory over New Mexico state in the Golden Gophers’ season-opener on Thursday night at TCF Bank Stadium. The main highlight of the victory from P.J. Fleck’s squad came on an absurd punt return touchdown from Antoine Winfield Jr. Yes, he’s the son of three-time NFL Pro Bowl cornerback Antoine Winfield (don’t you feel old?). Incredible effort from Winfield, but we also can’t ignore how bad that tackling was from the Aggies’ special teams unit. Yikes. But the best part was definitely Winfield’s Marshawn Lynch-esque stiff arm to destroy a guy at the 20-yard line.